Previous results from AIM have shown that NLCs are like a great "geophysical light bulb." They turn on every year in late spring, reaching almost full intensity over a period of about 10 days. 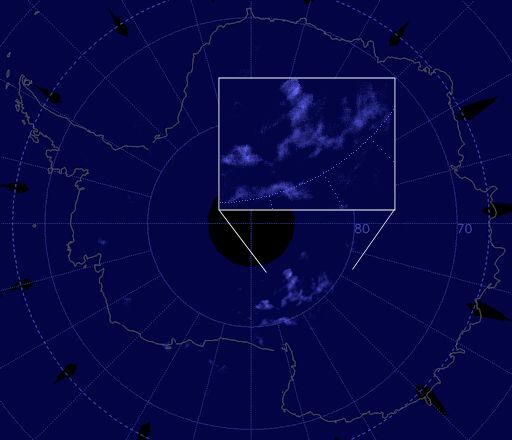 At the moment, only a few puffs and wisps of NLCs are visible over Antarctica. By Christmas, the whole continent could be blanketed in electric blue as the bulb begins to glow in earnest. It is interesting that noctilucent clouds over the Antarctic have appeared at about the same time as nacreous clouds (PSCs) over the Arctic. Pure coincidence? Maybe not. Although they are poles apart, the two types of clouds may be linked. "We do know that the meteorology of the northern winter stratosphere can impact the southern NLC region. A widely-cited mechanism for this teleconnection predicts that a cooling in the Arctic stratosphere – which is consistent with the appearance of PSCs – would lead to a cooling in the Antarctic NLC region, and thus a higher probability of NLC formation." In other words, nacreous clouds and NLCs should appear at the same time. Just one problem: "The literature to date suggests that the teleconnection is active only in January and February," says Randall. "This year, we could be seeing something new." "The wispy electric-blue clouds appeared near midnight on May 27th," says Staples. NLCs are Earth's highest clouds. Seeded by meteoroids, they float at the edge of space more than 80 km above the planet's surface. The clouds are very cold and filled with tiny ice crystals. When sunbeams hit those crystals, they glow electric-blue. Noctilucent clouds first appeared in the 19th century after the eruption of super-volcano Krakatoa. At the time, people thought the clouds were caused by the eruption, but long after Krakatoa's ash settled, the clouds remained. In those days, NLCs were a polar phenomenon confined mainly to the Arctic. In recent years they have intensified and spread with sightings as far south as Utah and Colorado. Some researchers believe the intensification is a sign of climate change. Early-season NLCs are always found at high-latitudes--e.g., Canada, the British isles, Siberia and Scandinavia. To people in those areas, we offer the followingobserving tips: Look west 30 to 60 minutes after sunset when the sun has dipped 6o to 16o below the horizon. 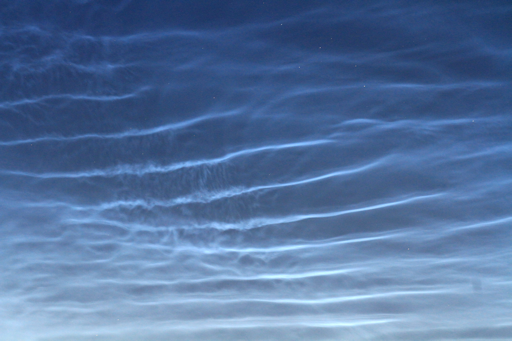 If you see luminous blue-white tendrils spreading across the sky, you may have spotted a noctilucent cloud. "The AIM daisy on Spaceweather.com showed a high concentration of NLCs over North America," says Thomas. "Yay! I thought to myself, let's get out there and see whats up. As I waited the coyotes howled and the owls hooted. Fighting the waxing gibbious Moon, the NLCs began to appear in the WNW sky--a lovely sight almost a year in the waiting." Noctilucent clouds are a true space weather phenomenon.They form at the edge of space, ~83 km above Earth's surface, when diaphanous wisps of water vapor wrap themselves around meteoroids to form tiny ice crystals. Long ago, they were confined to Arctic latitudes. As a result of climate change, they are now brightening and spreading, with sightings in recent years as far south as Colorado and Utah. Observing tips: Look west 30 to 60 minutes after sunset when the sun has dipped 6o to 16o below the horizon. If you see luminous blue-white tendrils spreading across the sky, you may have spotted a noctilucent cloud. Lichtende nachtwolken in Frankrijk gefotografeerd. "Yesterday, I asked for more noctilucent clouds, and today I was rewarded!" says Simon. "The NLCs this morning were much larger and brighter than the day before with spectacular waves." Observers saw them in other European countries, too: Sweden, England, Germany, the Netherlands, Denmark, Poland, Hungary and Romania. The sighting in Romania is significant because of its latitude--only 46 degrees. This means the clouds have spread south to mid-latitudes. "It was my first time seeing noctilucent clouds in real life," says Stefan Leahu of Cluj, Romania. "What a wonderful display!" When noctilucent clouds first appeared in the 19th century, you had to travel to near-Arctic latitudes to see them. In recent years, however, they have intensified and spread with sightings as far south as Colorado and Kansas. There is mounting evidence that this is a result of climate change. The frequency of sightings in Europe suggests that electric blue ripples could soon appear over the USA. Observing tips: Look west 30 to 60 minutes after sunset when the sun has dipped ~10 degrees below the horizon. 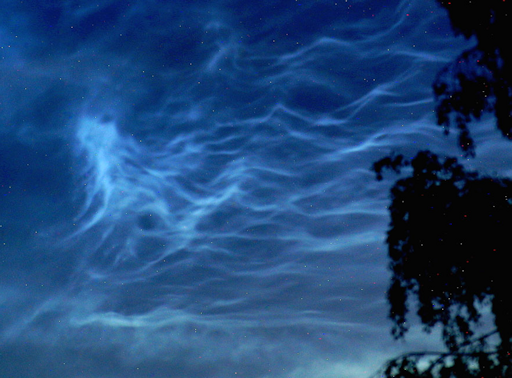 If you see luminous blue-white tendrils spreading across the sky, you may have spotted a noctilucent cloud. The luminous swirls in Nuke's picture are a sign of gravity waves. Gravity waves are, essentially, waves of pressure and temperature kick-started in the lower atmosphere by, e.g., powerful storm systems. Gravity does not vary inside the waves; they get their name from the fact that gravity acts as a restoring force that tries to restore equilibrium to up-and-down moving air. Gravity waves can propagate all the way from Earth's surface up to the mesosphere, where they imprint themselves on the the forms of noctilucent clouds. Often, gravity waves break in the noctilucent zone, dumping their energy and momentum there. Laser radar studies of noctilucent wave structures can trace this energy and tell researchers a great deal about upper atmospheric circulation. 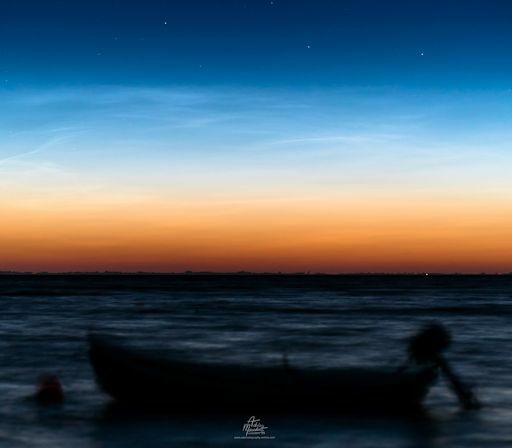 The southern hemisphere noctilucent clouds (NLC) season has started early this year and tied with 2013 for the earliest southern hemisphere season on record. The 2016/17 southern hemisphere noctilucent clouds season started on November 17 and tied with 2013 for the earliest southern hemisphere NLC season in the CIPS data record, said Cora Randall, a member of the AIM science team at the University of Colorado. "This was not at all a surprise," she added, "as the southern hemisphere polar stratospheric winds switched to their summer-like state quite early this year." At the end of the 2014/15 season, in March 2015, Randall reported that the season was clearly different from the rest in an 8-year-plot of the Antarctic noctilucent cloud frequencies. "This season [2014/15] was not like the others. The clouds were much more variable, and there was an enormous decrease in cloud frequency 15 to 25 days after the summer solstice. That's when the clouds are usually most abundant." These data come from the AIM spacecraft, which was launched in 2007 to monitor NLCs from Earth orbit. The curves show the abundance ("frequency") of the clouds vs. time for 120 days around every southern summer solstice for the past 8 years. Previous research shows that NLCs are a sensitive indicator of long-range teleconnections in Earth's atmosphere, which link weather and climate across hemispheres. The strange behavior of noctilucent clouds in 2014/15 could be a sign of previously unknown linkages. "Preliminary indications are that it is indeed due to inter-hemispheric teleconnections," Randall said. According to Dr. Tony Phillips of the SpaceWeather.com, there is growing evidence that noctilucent clouds are boosted by climate change. In recent years they have been sighted at lower latitudes than ever before, and they often get started in earlier months as well. Below is, by far, the best noctilucent clouds timelapse we've seen so far. Don't miss it, press play now. They were visible until about 2 in the morning," says Mauduit. Follow-up reports of NLCs have been received from Latvia (May 27th) and Northern Ireland (May 31st). Interestingly, NLCs haven't always been here. They first appeared in the 19th century after the eruption of super-volcano Krakatoa. At the time, people thought the clouds were caused by the eruption, but long after Krakatoa's ash settled, the clouds remained. In those days, NLCs were a polar phenomenon confined mainly to the Arctic. In recent years they have intensified and spread with sightings as far south as Utah and Colorado. Some researchers believe the intensification is a sign of climate change. 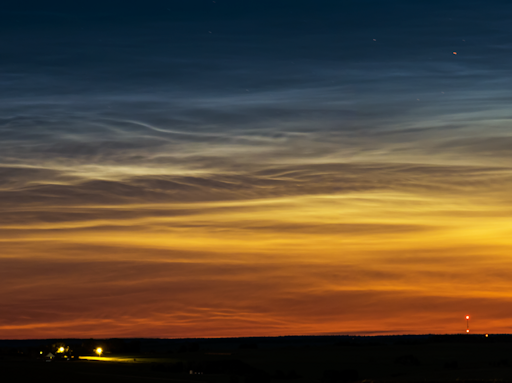 Marek Nikodem photographed these NLCs from Szubin, Poland, on the night of the summer solstice. "The clouds were visible all night, from dusk to dawn," he says. "Their structure changed dynamically in the direction of the waves. It was a good start to summer." When noctilucent clouds first appeared in the 19th century, you had to travel to Arctic latitudes to see them. In recent years, however, they have intensified and spread with sightings as far south as Colorado and Kansas--a development that might be related to climate change. Observing tips: Look west 30 to 60 minutes after sunset when the sun has dipped ~10 degrees below the horizon. 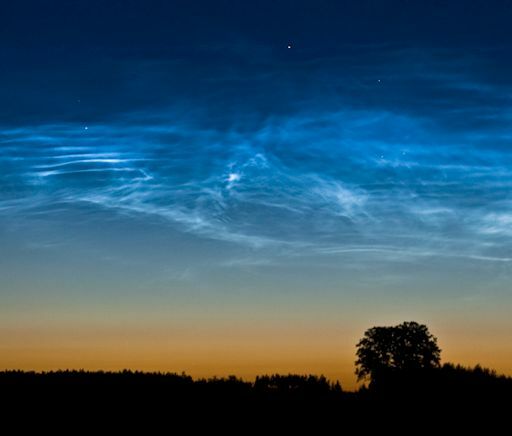 If you see luminous blue-white tendrils spreading across the sky, you may have spotted a noctilucent cloud.